Occupation: Enforcer (presumably); perhaps a malevolent sort of prankster. Enemies: Jim Garver, Jane, Larry, Philip Randall, unnamed cop. Powers/Abilities: Joe is a voiceless, intangible, invisible being who enforced all of Larrys angry or violent wishes, intentional or otherwise. Joe has numerous super-human abilities, being able to fuse a mans lips shut, break the leg of someone miles away, or stop a persons heart without even touching it. Joe took the physical form of Larrys shadow. History: (Adventures Into Terror#7)- Larry, panicked and hysterical, tried to write down everything that had happened in the past few days, to try to make sense of it all. The insanity all began a week ago when Larry and his girlfriend, Jane, were over having dinner with Arnie and Pearl. Arnie was throwing a dinner party for his boss, Phillip Randall, in order to keep his job. Randall was over a half-an-hour late, and as a result the dinner was ruined. When Arnie and the others began to talk of what a crude, ill-tempered, and inconsiderate man Randall was, Larry decided to play a little joke. Larry remarked that he ought to send Joe after him. When everyone asked who Joe was, Larry replied that Joe was his constant companion who got even with people he didnt like. 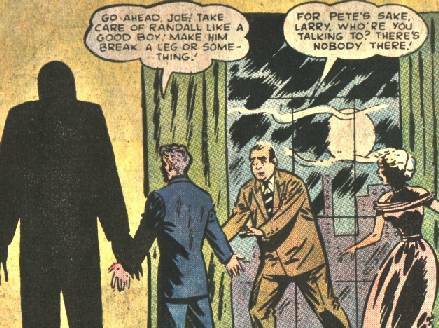 Speaking to his shadow, Larry asked Joe to go break Randalls leg or something. Almost immediately afterward there was a telephone call. When Pearl answered, everyone learned that Randall couldnt come because he had just broken his leg. Nervous and frightened, Larry just passed it off as some bizarre coincidence. Soon the story of Larrys weird little joke got around to Larrys friends at the office, who were curious about this Joe. Larry was joking about it by then, warning his buddies not to cross him or hed sic Joe on them. 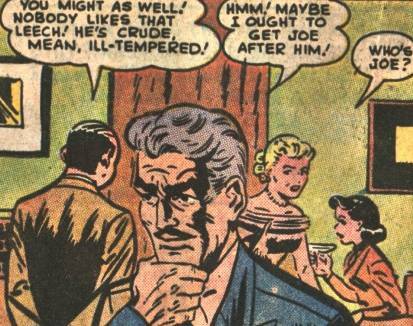 However, one of Larrys rival co-workers, Jim Garver, enjoyed kidding about Joe so much that it grew to annoy Larry. After a few days of this, Larry grew tired of all the Joe jokes, and one day instead he just told Jim to get lost. A few days later, it was discovered that Jim had gone on a trip to Chicago and nobody had ever heard from him again. The cops questioned everyone in the office, including Larry. While being questioned, one of the co-workers brought up Joe. At first the cop was suspicious but then Larry explained that Joe was just some prank. The cop remained suspicious but dismissed the idea of an invisible goon as nonsense and left. Jim Garver was never found. Larry was now growing more nervous. With Jim Garvers disappearance, it was becoming more and more difficult to pass it off as a coincidence. Larry decided not to take any chances. Returning to his apartment, he again turned to his shadow and begged Joe to just leave him alone and go away. Jane showed up, and found Larry struggling with something that wasnt there. Jane consoled Larry and told him that he was only imagining Joe. Jane begged Larry to forget about the whole thing. But now, Larry was convinced Joe was following him, awaiting orders. Trying to run away from his own shadow, Larry caught the attention of a cop. When the cop asked what was wrong, Larry, hysterical and irritated, replied to the cop to shut his mouth and keep it closed. Immediately the cops lips sealed together. Larry ran away, as the cop spasmed and convulsed in front of terrified onlookers. 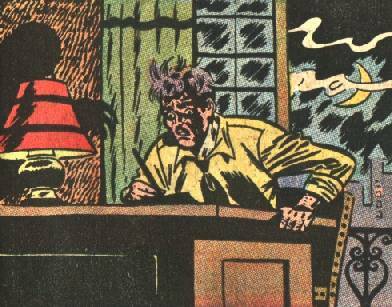 Larry returned to Janes apartment, demanding to be left alone and shouting at Joe. Thinking him to be mentally ill, Jane went off to call a doctor. Nearly insane with fear and anger, Larry screamed at Jane to drop dead. 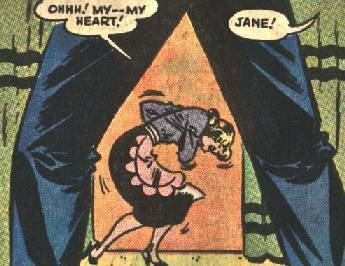 Immediately, Jane suffered a heart attack and fell down dead. Terrified and in grief, Larry laid her body on the coach, and began to write down everything that had happened. Now nearly finished writing it all down, Larry agonized over whether the whole thing was just a series of horrible coincidences or if Joe really did exist. Not seeing the shadow behind him, Larry ended the note by writing that hed rather be dead. At that moment Larry realized what he had done, but he was too late and Joe killed him. Joe could really be anything. He could be some manner of demon that finds a host to perform acts of violence for in order to cause its host misery. The fact that he has a shadowy form suggests that perhaps hes from the extradimensional world of Warlord Kaa and Mr. E. Or perhaps Larry unknowingly had some low level psychic abilities and Joe was merely his subconscious manifested. I like the extradimensional idea the best, but all possibilities are equally logical. I dont know whether Joe would have continued to exist after killing Larry. My guess hes still lurking around, searching for a new host. Hed make a keen enemy for any of Marvels magic or supernatural based heroes. In the story "The Shadow" in Suspense#10 (September, 1951) the stage magician the Great Shodini had a Living Shadow that was still around (seen at his funeral and later leaping toward the man the Great Shodini earlier commanded it to kill) even after he was killed by a car. This story was reprinted in Crypt of Shadows#4 (July, 1973). Larry was an average guy, who just made up Joe as a joke to play on his friends, but to his horror found that Joe was all too real. He learned that Joe was also impossible to control. Larry grew more and more hysterical as he realized Joe was uncontrollable and deadly. Larry accidentally caused his own death when he wrote "I wish I was dead" after feeling such grief for all the terrible things he had been partially responsible for. Jane was Larrys girlfriend (or maybe his wife, it's unclear). Larrys growing hysteria over Joe frightened Jane and she thought he had had a nervous breakdown. When she went to call the doctor, Larry yelled at her to drop dead and Joe caused her heart to stop. Jim Garver was a co-worker of Larrys who thought the whole Joe incident to be pretty funny and made jokes about it often. Soon Larry got a bit irritated with Jims jokes and told him to get lost. Later Jim took a trip to Chicago, and Joe made sure nobody ever heard from him again. 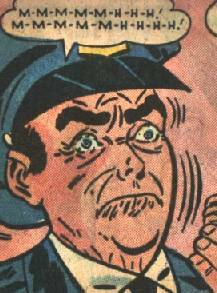 An unnamed cop also suffered the wraith of Joe when Larry yelled at the cop to shut his mouth. Joe caused the cops lips to seal shut.